"The story must start with my father, a famous undersea explorer—if I spoke his name, you would recognize it. My mother died when I was a baby, and he turned to his work of solving the ocean's secrets. His greatest discovery was an ancient city, in the depths where no other diver had ever penetrated. My father believed it was the lost kingdom of Atlantis. He made himself a water-tight home in one of the palaces and lived there, studying the records and devices of the race's marvelous wisdom. From the books and records, he learned ways of teaching me to live under the ocean, drawing oxygen from the water and using all the power of the sea to make me wonderfully strong and swift. By training and a hundred scientific secrets, I became what you see—a human being who lives and thrives under the water." 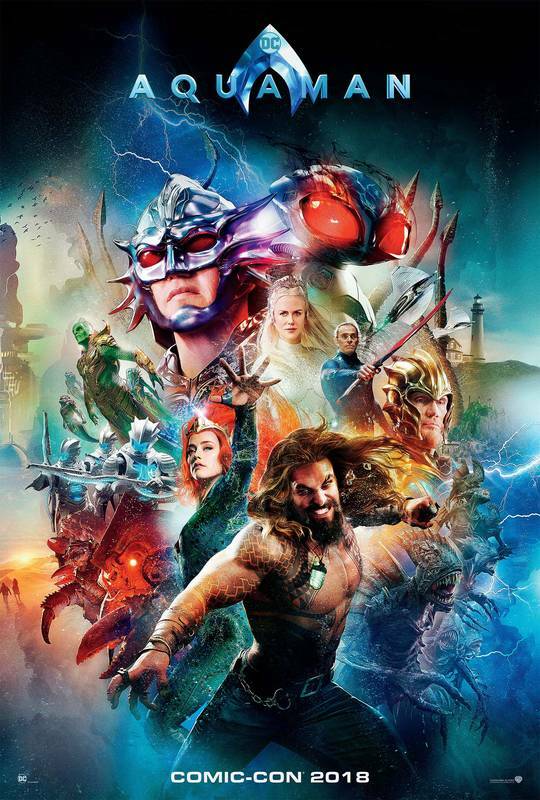 From Warner Bros. Pictures and director James Wan comes an action-packed adventure that spans the vast, visually breathtaking underwater world of the seven seas, Aquaman, starring Jason Momoa in the title role. The film reveals the origin story of half-human, half-Atlantean Arthur Curry and takes him on the journey of his lifetime—one that will not only force him to face who he really is, but to discover if he is worthy of who he was born to be a king. Jason Momoa as Arthur Curry / Aquaman: A half-Atlantean half-Human who is reluctant to be king of the undersea nation of Atlantis. He has the ability to manipulate the tides of the ocean, communicate with other aquatic life, swim at supersonic speeds, and possesses superhuman strength. Amber Heard as Mera: Arthur Curry’s love interest, a warrior and daughter of the king of the Atlantean tribe of Xebel, who was raised by Queen Atlanna and groomed to become queen. Mera possesses hydrokinetic and telepathic powers that allow her to control her aquatic environment and communicate with other Atlanteans. Willem Dafoe as Nuidis Vulko: Atlantis' counselor who would become a mentor of Arthur Curry when he first comes to Atlantis. Patrick Wilson as Orm / Ocean Master: Arthur Curry's Atlantean half-brother and ruler of Atlantis, who seeks to unite the seven underwater kingdoms to declare war on the surface world out of belief humanity polluted the seas. Dolph Lundgren as King Nereus: The king of the Atlantean tribe of Xebel and Mera's father. Yahya Abdul-Mateen II as David Kane / Black Manta: A ruthless treasure hunter and a high-seas mercenary with a flair for creating deadly technological innovations. Nicole Kidman as Queen Atlanna: The Queen of Atlantis, mother of Arthur Curry and Orm. Aquaman Movie Prop Peplicas, Figures, Toys and Collectibles!